There is growing scientific evidence that environmental factors such as light and sound affect our well-being. While we all know instinctively that sunshine makes us happier and certain noises relax or annoy us, research also suggests that environmental factors can help regulate our body clocks and stress levels. And that can have a noticeable impact on how we recover from illness and injury. 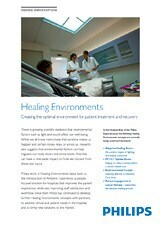 Philips has long been exploring how this knowledge can be used to improve patient experience and promote recovery. Our work in Healing Environments dates back to the introduction of Ambient Experience, a people-focused solution for hospitals that improves the patient experience, while also improving staff satisfaction and workflow. New Healing Environments concepts are continually being developed to address clinical and patient needs in the hospital, and to bring new solutions to the market.